We’d love your help. Let us know what’s wrong with this preview of Outbreak by Rick Wayne. An enigmatic mastermind recruits four people with extraordinary abilities and offers them everything they want in exchange for the impossible. But after one of them uncovers a plot to hack the human race, they're not sure which side they're on -- just that not all of them will survive. "The Minus Faction" is a super-powered speculative thriller in seven novella-length episo An enigmatic mastermind recruits four people with extraordinary abilities and offers them everything they want in exchange for the impossible. But after one of them uncovers a plot to hack the human race, they're not sure which side they're on -- just that not all of them will survive. "The Minus Faction" is a super-powered speculative thriller in seven novella-length episodes. In Episode Seven . . . The dead rise. Monsters clash. Enemies become allies. A king unleashes final Armageddon. And four unlikely friends decide the fate of the world. A good wrap-up to the series. I continue to think it would be better served presented as a single novel rather than a series of novellas, but it was a middlin' enjoyable read, altogether. Damn, Rick Wayne, way to finish! What a rip-roaring, whip-lashing ride with this band of misfit warriors and flawed heroes. 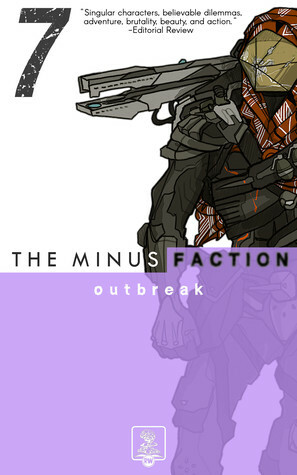 The Minus Faction never disappointed from episode 1 through episode 7. Sometimes the scenery is so beautifully complex that, in the adrenaline rush, you catch yourself breathless afterwards, and your psyche is left reeling with bruises you can't see but will definitely feel for quite some time. I will note a couple of odd edits here and there in #7, words misplaced or droppe Damn, Rick Wayne, way to finish! What a rip-roaring, whip-lashing ride with this band of misfit warriors and flawed heroes. The Minus Faction never disappointed from episode 1 through episode 7. Sometimes the scenery is so beautifully complex that, in the adrenaline rush, you catch yourself breathless afterwards, and your psyche is left reeling with bruises you can't see but will definitely feel for quite some time. I will note a couple of odd edits here and there in #7, words misplaced or dropped, but the story is too good and too fast to linger on those few nitnoids. First, I should say that I read each episode of the Minus Faction series as they were published, which means I forgot a whole lot of details. I highly recommend reading the series either all at once, or fairly close together so you don't miss anything. I think I would have enjoyed the story more if I'd read each episode back-to-back -- which is not to say I didn't enjoy it. I did. This is a series for people who like things that can be described as "action packed." If you are in the mood for a s First, I should say that I read each episode of the Minus Faction series as they were published, which means I forgot a whole lot of details. I highly recommend reading the series either all at once, or fairly close together so you don't miss anything. I think I would have enjoyed the story more if I'd read each episode back-to-back -- which is not to say I didn't enjoy it. I did. This is a series for people who like things that can be described as "action packed." If you are in the mood for a story that is filled with tension, movement, and scenes that would work well on the big screen, this is it. The story moves all over the world, you don't know exactly who the bad guys are for a quite sometime, and the cast of characters comes together with like a puzzle. From the first episode, I've compared the story to a comic book, even though there aren't any obvious elements that would lead me to that comparison. I've finally figured out why, though. It's a visual story. You have to picture the things that are happening. In this last episode, literally 70% of the book is an enormous fight scene. It takes place in a huge setting, a battle rages between humans, cyborgs, cyborg zombies, alien creatures, and when you get right down to it, between good an evil. I won't go into spoilers but read through the last installment in 2 days. 5 out of 5 fist-pumping, gut-wrenching, mind-blowing grebfoils! Its like one of those mag-propelled rail rides at a theme park. The ones that shoot you down a track a bajillion stories in the air and give you brief moment of freefall? You open the cover and the thing takes off whether you're ready or not and just as you don't think you're going to survive, you're greeted with a amazing view and a moment of relief only to realize you now gotta go back before its all over. And yet despite the insane amount of action, I never felt lost.